In last week’s post I promised that this week we would discuss homeschooling through transitions. So here is that promised post, and another look into our homeschool. One of the things I like best about homeschooling my girls is the flexibility it allows me. 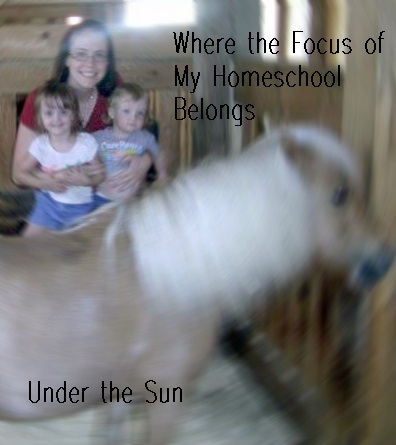 Currently we are in the middle of a big move and our homeschooling experience looks different from what it did a in the spring, or even over the summer. I really need the flexibility right now that I said I like. When you are packing, traveling, visiting relatives, and unpacking it is hard enough to keep anything that looks like routine, let alone homeschool. I have found though, when we completely give up a habit (especially those that are healthy) it is that much more difficult for us to return to. The problem with that though, is I can not keep up with our normal activities and stay on top of the move. A little self-directed play time, all while working on skills. 1. Reducing the number of days a week we are doing school. If we know that we only have to get in school three days of the week we can work around the curve balls that moving likes to throw. 2. Focusing on the basics. This means arts and crafts, and science are taking a back seat right now. 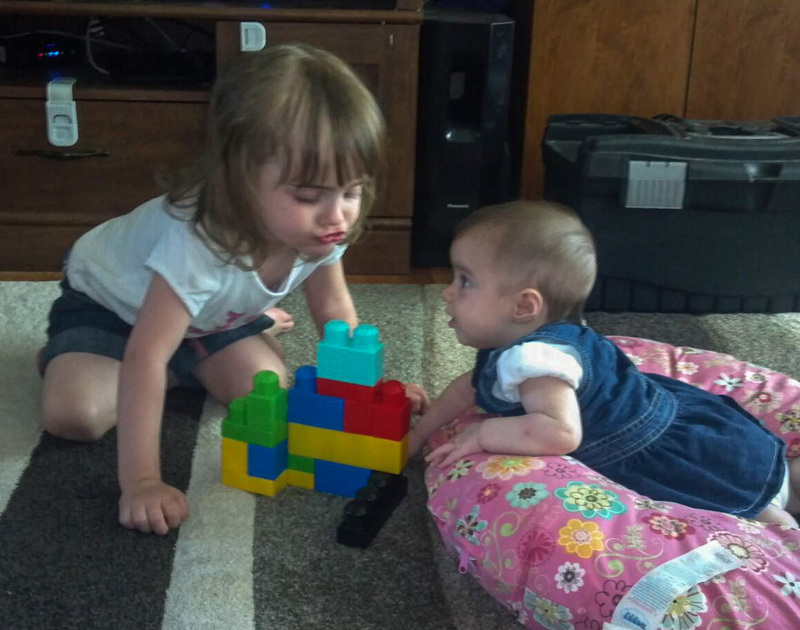 The girls are two and three, the more important things right now are play time, and learning: numbers, colors, shapes, patterns, and expanding vocabulary. 3. To reach our objectives, I am looking at methods and programs that can do more than one thing at a time. For example building with blocks we can play, discuss colors, count the blocks in our structures, and I can build things and see if the girls can repeat what I just made. 4. Last but not least, the one thing I am making a point of not sacrificing is story time. Story time doesn’t need to be a long drawn out affair to be effective, just as long as we spend quality time reading together. 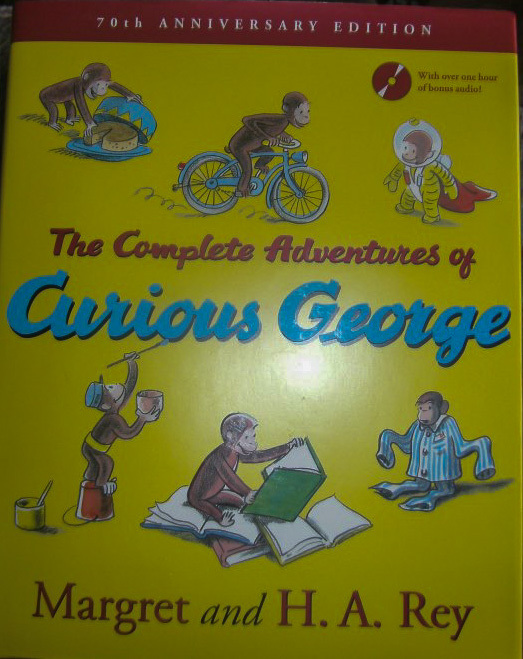 Curious George is a big favorite with my girls. This entry was posted in Homeschool and tagged Books, homeschool, Moving, Reading, school on August 27, 2013 by Sara R.
If you were to take a peek into life at the Russell house, you might begin to realize that my children’s education does not look exactly the same from day-to-day. One day we might be watching a little much TV for some people’s taste, but then on those days I try to balance it with outdoor play or anything else that involves being active. The next day we might be crafting and cleaning all day. Then again it might be a day full of errands and building blocks. One of my three-year old’s favorite kinds of days is spending time on ABCmouse.com, reading, cooking, playing outside, coloring, and playing with her trains. On a superficial level you might assume that there is no consistency to their education, but that is where you might be mistaken. Daily we are talking about colors, numbers, letters, and the kind of behavior we want to develop. We read bible stories daily, and stop to talk about what it is that we can learn from the stories. As my girls grow, we will develop a more regular routine for school, but at 2 and 3 years old I want their education to happen naturally as part of their lives. We still have workbooks and educational software, but those don’t need to be where they get the bulk of their education. I want them to see that learning can happen in almost every situation, and I want to nurture their natural love of learning. For now the consistency comes into play as we are learning daily in almost every situation. 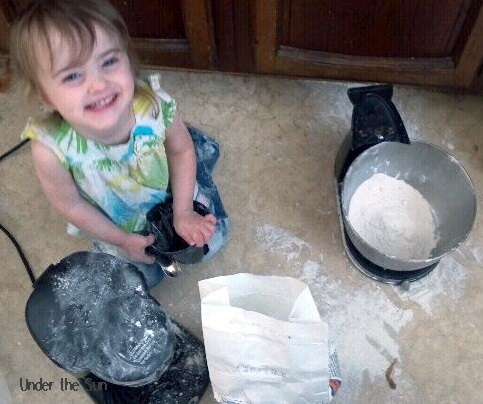 As I scoop flour they can help me count the scoops. 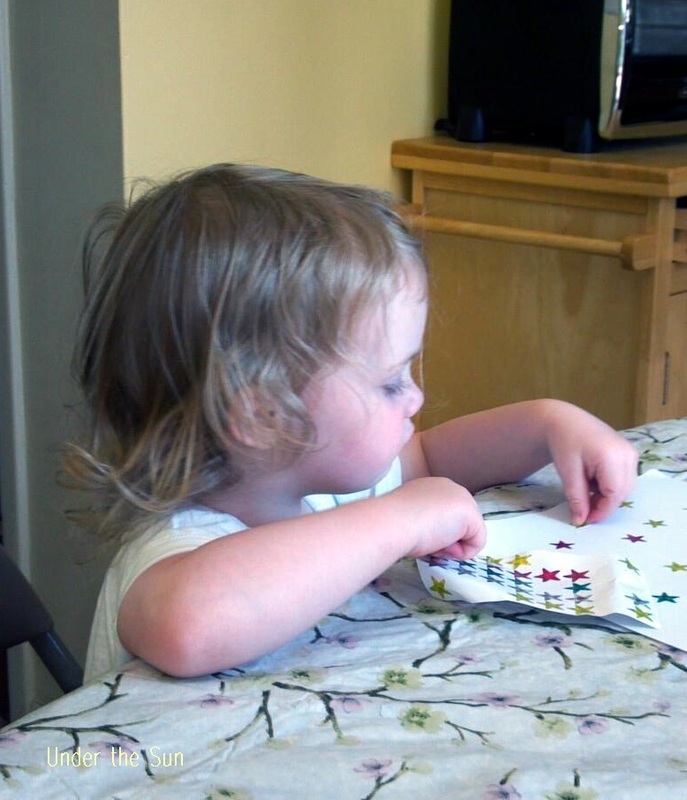 Crafting helps them develop fine motor skills, learn colors, shapes, and more. I can print coloring sheets that have the ABC’s or numbers, and we talk about what we see on the sheet. Their Mobigo’s and ABCmouse.com are both educational software that they can learn with as they play. Reading together helps to expand their vocabulary. So I offer you this encouragement while your children are young; don’t fret if they don’t like work sheets or anything that might resemble a formal education. Instead while they are young focus on developing your relationship with them. Your children are only this young once. Mother’s who are further along in this journey called life promise me that developing a relationship with your kids is foundational to almost every other aspect of parenting. This entry was posted in Homeschool and tagged Activities, Bible, Books, Children, homeschool, Kids, Love of Learning, Reading, Relationships, school on July 10, 2013 by Sara R.
Today begins summer break for many school age children. In an effort to celebrate summer, many of the libraries around here kicking off their summer reading programs. One library has a carnival type atmosphere to celebrate today. Our local library is actually hosting musicians on their front lawn, for you to come out and listen to. When nap time in this house is over, I plan on taking the kids out to sign them up for their first summer reading program. Granted this does mean Mommy will do most the reading. It is very important to me though to expose them to the world of books, and not just rely on the television and the computer for entertainment. 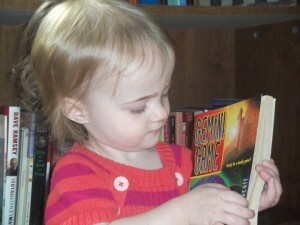 I suspect that my efforts to expose them to books is paying off. Chloe and Paige both will bring me stacks of books to read together. 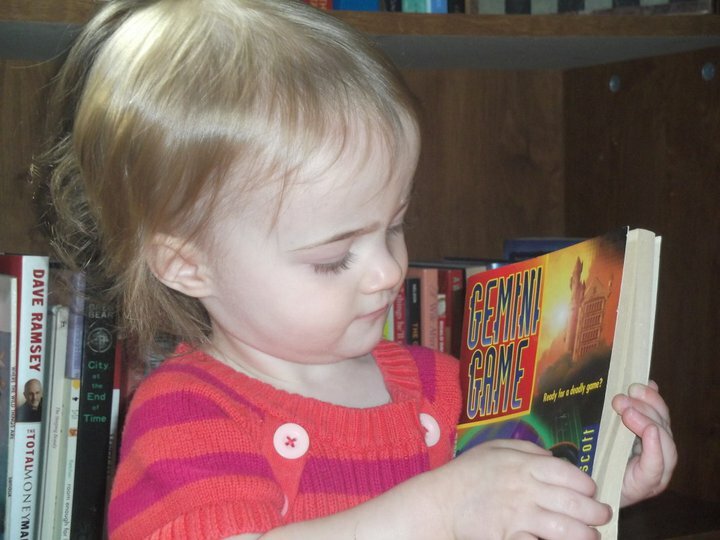 Chloe as a toddler with a book from our home library. As an avid reader myself, I can only hope that filling our home with books, and filling their childhood with memories of summer reading programs, will impart to them a lifelong love of reading. This entry was posted in Children and tagged Books, Kids, Reading, Summer on June 17, 2013 by Sara R.